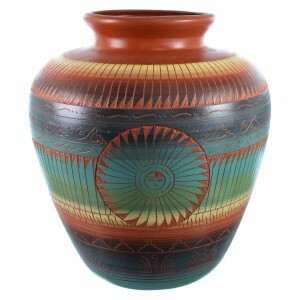 Pot measures approximately 9-1/4" tall, 8-1/8" wide and is 26-3/8" in circumference (around its widest point). 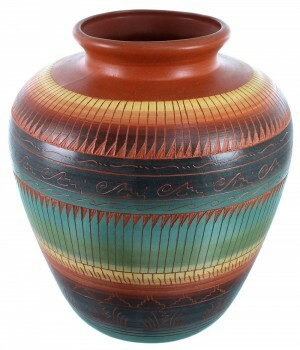 This Native American pot was hand etched and painted with a magnificent Sun design and lovely traditional patterns, by Navajo artist Marilyn Kinliche. 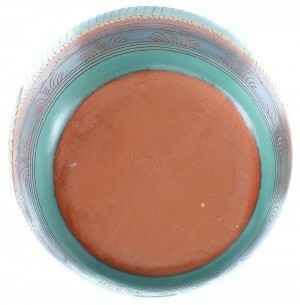 The pot is signed by the artist. In Native American beliefs, the sun is the provider of life, warmth, growth, and all that is good.